Macao Post and Telecommunications Bureau will launch the thematic pack “Traditional Chinese Virtues” on 8 August 2017. 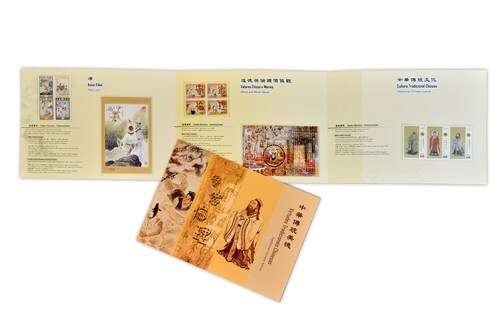 This pack comprises three stamp issues including "Filial Love" in 2002, "Ethics and Moral Values" in 2007 and "Traditional Chinese Culture" in 2017, conveying the traditional Chinese virtues to all over the world, passing onto the next generation and to spread the education of love and sincerity. This pack will be available for sale at the Philatelic Shop of General Post Office, “Rua do Campo” Post Office, Maritime Ferry Terminal Post Office, Airport Post Office, and the Communications Museum. The selling price is MOP90.00.